The 2015 Suzuki RM-Z250 is set to continue to be a favourite among Junior and Senior Lites riders as it hits Australian showrooms this month. 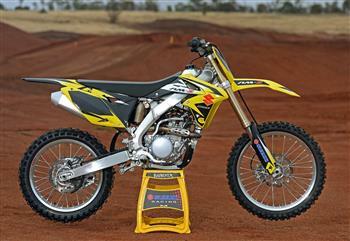 The 2014 Suzuki RM-Z250 is set to win a new legion of fans when it hits Australian showrooms later this year. The all-new 2013 Suzuki RM-Z250 is due to arrive on Australian shores mid September and is sure to leave its competitors in their wake. The all-new 2013 Suzuki RM-Z250 is sure to leave its competitors in their wake when it arrives in Australia in the forthcoming months. Suzuki's 2012 RM-Z250 motocrosser has been unveiled and ready to take on any competition. Suzuki's 2011 RM-Z250 motocrosser has been unveiled, ready to lead the pack and featuring exciting updates. All-New, Fuel-Injected Suzuki RM-Z250 Lands! Ready to win out of the crate, Suzuki's all-new, fuel-injected, 2010 RM-Z250 motocrosser is now available in Australia. Following in the footsteps of the ground-breaking Suzuki RM-Z450 motocrosser, Suzuki's all-new, 2010 RM-Z250 will become the first production motocross machine in its class to feature electronic fuel-injection. Suzuki's 2009 RM-Z250K9 motocrosser has landed in Australia, ready to lead the pack. The 2008 Suzuki RM-Z250 Has Landed! Suzuki Australia has announced the arrival of the new RM-Z250K8 four-stroke motocross machine, featuring a number of key developments that ensure it will be the one to catch on the racetrack.